Have you noticed lately that the world is becoming notably less tolerant of our biblical beliefs? Moral relativism and immoral perspectives are not creeping, but charging, into our communities, public education system and even into our churches. Soon our children and grandchildren are going to be on the front lines. It is our jobs to prepare them. It’s our job to be raising godly leaders. Coming from a corporate background prior to marriage, kids and homeschooling, I’ve always had an interest in leadership. But there’s a difference between training leaders in the marketplace and raising leaders at home. As Christian parents we not only want to raise leaders; we want to raise godly leaders. I know it’s a lot to ask harried moms struggling to get in the academic basics, but it’s crucial that we look at the big picture and intentionally raise our children to be godly leaders. 1. Teach the Word daily and model integrity. Men and women who are leaders have integrity. Integrity is moral uprightness; displaying strong principles based on truth. Without daily teaching of the Truth, your children will not know how to recognize it from the falsehoods constantly bombarding them from our culture. When an integrity issue comes up, put the books away and deal with it immediately. There are some non-negotiables when it comes to behavior, and integrity is one of them. As Christian parents, hold yourselves to the same standard and remember that you have little ears and eyes listening and watching. And when you are at fault for something – apologize immediately. Just as they are accountable to us, we are accountable to God. 2. Keep your eyes on the big picture: share your vision for your children with them from an early age. Teach your sons and daughters that they are made in God’s image, and that He has given them unique strengths and special talents. Teach them that God gives us those to accomplish great things for His kingdom. Share with them how excited you are about them and how you can’t wait to see those special gifts and talents develop as they grow up! Remind them of this periodically and identify and reinforce these gifts and talents as they appear, because they will! 3. Train your children to have sound physical and mental habits. Probably because my husband and I lived so far away from our parents, we had no clue how to raise children. Then we moved to the South where children’s roles are very well defined, and we learned the secret: You train them to have good habits. Habits are skills that are cultivated in our children by training, repetition and accountability. Character is molded through habit training, whether they be physical habits or intellectual ones. 4. Read and discuss stories that show children as godly leaders. If you are using a literature-based homeschool curriculum (and I hope you are! ), read historical fiction and literature with characters who demonstrate the leadership traits you would like to see in your children, such as: integrity, humility, responsibility for self and others, reliability, initiative, willingness to be self-sacrificing, ability to learn from mistakes, resistance to peer pressure, willingness to tackle difficult problems with a positive attitude, diligence, and perseverance. 5. As you study history and current events, regularly point out and discuss examples of exemplary and poor leadership. History is full of examples of leadership and good character, as well as their opposites! If you use a Charlotte Mason-style, literature-based homeschool curriculum, you have the perfect opportunity to set a feast of inspiring characters before your children on a regular basis! Choose books with plenty of examples of great men and women of the past, and in your discussions and assignments, compare and contrast them with others, as we do in our high school World History I course, subtitled Lessons in Leadership. Additionally, do not wait until your kids are old enough to vote to discuss local and national candidates for public office. Talk about the jobs candidates are campaigning for as well as their track record and experience. Identify leadership experience within their backgrounds. The newspaper and other media are full of articles of both exemplary and poor leaders. Draw their attention to these snippets and help them to identify these differences in discussions. 6. Give your children opportunities to practice leadership inside and outside the home. From being responsible for their own belongings at home, teach them to be responsible for pets, chores and their own school supplies. Let them be responsible for a family event, such as a service project, teaching them to plan, anticipate, organize and communicate with others what their roles will be. Give them a small garden to research, plan, plant, weed and harvest. Encourage industriousness and entrepreneurship. Let older children be responsible for helping to teach younger children at home, as well helping teach Sunday School, Youth Group, etc., at church. Help them expand into service to the community, such as spearheading a neighborhood or road clean-up project. Encourage your high school students to earn all or part of the money for their own activities, rather than just handing money over like so many other parents do. This happened regularly with friends of my son, particularly, and it was very difficult at the time, but our firm stance on this issue has reaped many benefits since then! Let your high school student make his own appointments. Does he need to go to the dentist? Call the doctor’s office to get a refill on a prescription? Look for a summer job? Please don’t do those things for him — let him do them himself. We owe it to our children to prepare them to live in the world they will be facing in just a few short years. They must be mature, steadfast and well-grounded to be who they were designed to be. 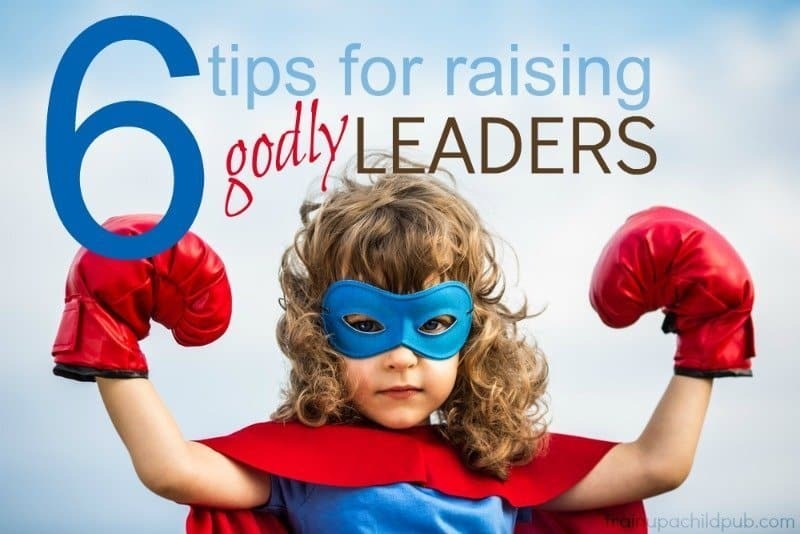 What are you doing to encourage godly leadership in your children? What are your biggest challenges to instilling leadership characteristics in them? Great tips Dana! There is nothing more important in raising our kids than keeping the big picture in mind. It is so easy to get stuck in the moment of right now and lose sight of the long term impact of that moment or short cut will have. Amen, Rayna; thanks for sharing!